That's a pretty ridiculous message, but it seems to be the one the Democrats tried to send us from the convention floor. 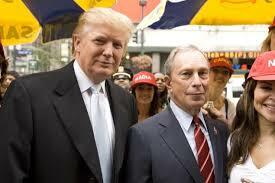 I didn't watch Bloomberg speak because I have a pretty reliable gag reflex, but that's what people are telling me. This is a really hard year for me. As a teacher, I find very deep flaws in candidate Hillary Clinton but even deeper ones in Donald Trump. Here's the thing--people on Facebook are always trying to persuade me to vote for this or that person. Oddly, many who want me to vote for Hillary Clinton try to persuade me by telling me what a moron I am. Or they tell me if I'm not supporting Hillary I'M SUPPORTING TRUMP AND THEY PLACE IT IN ALL CAPS WITH LOTS OF EXCLAMATION MARKS!!!!!!!!!!!!!!! The other day, even after I'd said I'd decided to vote for Hillary, the same guy let me know that Sanders was just like Reagan. I have no idea why he made that comparison, and he didn't explain. Like all Sanders supporters, I suppose, I'm fluent only in English and could not quite make contact with the voices in his head that gave him this info. This notwithstanding, I lived through twelve endless years of Michael Bloomberg. I lived through his ridiculous Chancellors Klein, What's-Her-Name, and Walcott. I watched as they sold us out to the reformies. I watched as children stood freezing on the streets via his no bid bus contracts. I watched as schools were closed and his sham PEP ignored entire communities in predetermined sessions, and as he preemptively fired anyone who contemplated disagreeing with him. I watched them make a farce out of Robert's Rules. I watched him spend millions of dollars on ridiculous computer systems that never helped with anything, and are now garbage. I watched as he pretended to be a man of the people taking the subway, but actually kept two SUVs in front of his townhouse to drive him to his preferred subway stop. I watched as he equipped his SUVs with window air conditioners because the AC in them didn't keep his sensitive body quite cool enough. And in the cold weather, while New Yorkers would slog through snowstorms, while children and teachers forged hazardous paths to school, Bloomberg would often be nowhere to be found, and people would wonder where the hell he was. The NY Times thought he might be in Bermuda. After all, what better way to show that you are a regular city resident like everyone else than to duck out to a tropical paradise in a private plane whenever things got rough? And then we could rely on the Emperor, if he happened to stay in town for a weather emergency, to explain it not only in English, but also in the worst Spanish I've ever heard. Well at least he wasn't building a wall, and the only group he really seemed to hate was public school teachers. There was actually one other group Bloomberg treated with outright contempt. He worked to overturn the twice-voiced ballot of the people for term limits. He and Christine Quinn cooked up some scheme to overturn them, only that year and only for themselves. In a democracy, the vote of the people is supposed to be the ultimate power. Well, not for Emperor Michael Bloomberg. He bought another term fair and square with a few millions worth of pocket change he had lying around. While I can't say his contempt for voters was as consistent or vicious as that he held for teachers, he certainly had no problem brushing them aside when they became an inconvenience. Michael Bloomberg was once a Democrat, but changed his registration to Republican when it appeared that would help make him mayor. I have no idea what party he belongs to now, if any. I can only say for sure that he is a plutocrat and a blatant opportunist. If Hillary is paying attention, she knows that a prime reason he supports her is that his pollsters told him he could not win a presidential election. I'll tell you one more thing, Hillary. If you want me, or working teachers who aren't on the union gravy train to support you with anything resembling enthusiasm, you'll stop wheeling out the likes of Mike Bloomberg to support you. I agree with you when you suggest the only thing Donald Trump cares about is Donald Trump. I'll give you three guesses what Michael Bloomberg cares about.